London: Tho. Burrell, Printed By H. Bruges. 1674. F First Edition. H Hard Cover. Good. First edition, 1674. First book on English dialects, in a mid 19th century binding, with the armorial bookplate of English divine and antiquary Henry Thomas Ellacombe (1790-1885) on the front pastedown (name is not on the bookplate; was identified through Wertcounty Studies Library website, and was engraved by Burnell). Externally worn in three quarter smooth brown calf over marbled boards, brown spine label, raised spine bands, all edges tinted red, title page printed in red and black, 5.75" tall, pages numbering to 178 but with a pagination error (typical for this book) that omits pages 143-172. The rebinidng resulted in renewed endpapers and replaced blanks at front and rear. Covers heavily worn with chipping tot he leather, joints cracked with front cover holding by binder's cords, text block sound, pages clean with only some very minor occasional foxing, fairly faint dampstain to final five leaves, old repair to small closed tear to title page with no paper loss, modern name stamp on final blank, old dealer catalog description for a book of this title mounted on verso of rear free endpaper, no names or markings on pages. 1674. Legal Foundations of the War of Devolution La Feuillade, Georges d'Aubusson de [1612-1697]. La Defense du Droit de Marie Therese d'Austriche, Reine de France a la Succession des Couronnes d'Espagne. Paris: Chez Sebastien Mabre-Cramoisy, 1674. [xxiv], 164,  pp. 12mo. (5-1/2" x 3"). Contemporary sheep treated to resemble tree-calf, gilt spine with raised bands, speckled edges. Some rubbing to extremities with minor wear to spine ends, corners bumped. Toning to text, faint dampstaining and spotting to a few leaves, internally clean. $1,250. * First edition. The author was the Archbishop of Embrun, later Prince-Archbishop of Metz. Mazarin appointed him ambassador to Venice in 1659. Louis XIV appointed him ambassador to Spain in 1667 to pursue French claims to the Spanish Netherlands in the name of Maria Theresa of Austria (1638-1683), the Spanish Infanta and Queen Consort of Louis XIV. These claims were tenuous and constructed on intricate legal foundations. French jurists argued that the Spanish Netherlands should not go to the still underage heir to the Spanish throne, Charles II of Spain (1661-1700), because he was the issue of the second marriage of Philip IV. Maria Theresa on the other hand was a result of his first marriage and the lands thereby 'devolved' to her and, of course, Louis XIV. France's claims led to the War of devolution (1667-68). Feuillade defends France's claims with an argument grounded in the "fundamental laws of Spain, the examples of past centuries and the solemn judgments of the Royal Council of Castile." A second edition was published in 1699. Both copies are scarce, especially in North America. OCLC locates no copies in North American law libraries. British Museum Catalogue (Compact Edition) 1:1145. KIÖPING, NILS MATSSON - WILLMAN, OLOF ERIKSSON - CARON, FRANÇOIS) ETC. - WISINGBORG-TRYK. Een kort Beskrffning uppå trenne Reesor och Peregrinationer sampt Konungarijket Japan: I. Beskrifwes een Reesa som genom Asia Africa och många andra hedniska Konungarijken sampt öijar: med flijt är förrättad aff Nils Matson Kiöping fördetta Skepzlieutnat. II. Beskrifwes een Reesa till Ostindien/ China och Japan: III. Med förtälliande om förbenembde stoora och mächta Konungarijketz Japan tillstånd sampt thesz Inwånares Handel och Wandel: förrättat och beskrefwin aff Oloff Erickson Willman, kongl. mayst:tz Skepz-capitaien. IV. Uthföres een Reesa ifrån Muszcow till China/ genom Mongul och Cataja/ öfwer strömen Obij: förrättat aff een rysk Gesandt som till then stoore Tartaren Niuki war skickad. Then gode Läsaren till tienst uthi thenna Book. Pars Orientalis Palatinatus et Electoratus Rheni Episcopatus Spirensis, Wormbensis et Comitatus Leiningen Nova, et Accurata Descriptio ex Officina Francofurti Joh. Georg Walther.':. Gesamtansicht über den Rhein ('Worms Palatinat'). Quai Saint-Bernard mit dem Porte Saint-Bernard und Blick auf Notre Dame ('Das St. Bernard Thor in Paris welches 1606 von Heinrich dem IV. erbauet und 1674 von Ludwig dem XIV. um vieles verbessert worden - La Porte St. Bernard A Paris sut construite sous le regne de Henri IV. l'an 1606 et refaite beaucoup plus comode qu' auparauant par le partage de 2 portes egales, sous le regne de LouisXIV L'an 1674 .'). Ordinanza della Cavalcata che si fece nell ingresso in Vienna dell Augustis.ma Imp.a Margherita fuori della Porta d Ungheria V. Decembre MDCLXVI". Aus Galeazzo Gualdo Priorato, "Historia di Leopoldo Cesare [.] Parte terza". Den Roomschen pelgrim ofte pelgrimagie van (...) Joannes Georgius Guilhelmi van Cranenburgh, Proto. apost. ende pastoor der Parochiale kercke van St. Laurentius tot Maesniel in de heerlyekheyt Dalenbroeck. Verdeylt in ses deelen, waer in (...) beschreven worden alle curieuse en denckweerdighe saken die hem op de reyse, soo te water als te landt (...) sijn voorghevallen. Roermond, Petrus Vallen, 1699. "4°, gebonden in 19e eeuwse half leren band (scharnieren gesleten, boekblok los). (32+953+(39) pag. Geillustreerd met ruim 100 houtsneden in de tekst en 17 bladen met afbeeldingen en tekst buiten de collatie. Mist 3 bladen: *1 (de titelprent) en de tekstbladen eeeee 2 en 3. Smoezelig exemplaar. Uiterst zeldzaam. STCN: 1 exemplaar (UB Nijmegen, ook incompleet). NCC online: 2 exemplaren (UB Nijmegen en UB Tilburg); Tiele 431 (als Guilhelmi). Vroeg reisboek, gebaseerd op een voetreis naar Rome uit 1674-1675, geschreven als gids voor andere reizigers. De manier van drukken en illustreren doen denken aan een volksboek. In het voorwerk een approbatie d.d. Roermond 4-12-1698 en drempelverzen van Petrus ab Ophusius, vicaris te Maasniel en Fr.D. Haen. De reis liep van Roermond via Keulen, Frankfort, Augsburg, Insbruck, Trente, Venetie, Ravenna, Ancona, Lorette, Foligno, Assisie, naar Rome en Napels en daarna terug via Sienna, Florence, Bologno, Milaan, Como en Bonn.". Pharmacia galenica & chymica, dat is Apotheker ende alchymiste ofte distilleer-konste. Rotterdam, Van Waesberge, 1661 [op gegraveerde titelpagina: 'Nieu licht der Apothekers en distilleerkonst']. "Moderne geheel perkamenten band, (8)+460+(12) pag. Met fraai gegraveerde titelpagina met interieur van een apotheek en enkele houtsneden in de tekst. Oud eigenaarsmerk in pen: 'Johannes Veldinck, chirurgijn, 1674'. Laatste pagina's (register) gerestaureerd. Het gehele boek watervlekkig. STCN: slechts 2 ex. ; Wittop Koning, Compendium Pharmacie (1986).". à Paris: Chez Claude Barbin, 1674. Fine. Chez Claude Barbin, à Paris 1674, In 8 (15,5x23cm), (4) 178pp. (2) ; (5) 102pp. (7) (1), relié. - First edition of Boileau and works with the term containing 9 satires, epistles 4, the first four songs of the lectern and the Treaty of the sublime. The edition also contains a new foreword and a new preface. Beautiful print in italics. There exists an edition of parts dating from 1670 which Boileau Boileau speaks without mentioning the date, but that seems not found; Brunet cites the comment, without giving a date. Full sheepskin marbled time. Back to nerves Jansenist. Piece black title. Rubbed together. 2 corners bumped. He misses the second sheet completing the privilege (last lines indicating the date). The two frontispieces are also missing, one must appear before the title, the other before the lectern. Title page with dirt. Important issue. --- Please note that the translation in english is done automatically, we apologize if the formulas are inaccurate. Contact us for any information! - [FRENCH VERSION FOLLOWS] Première édition de Boileau comportant le terme Oeuvres et contenant 9 satires, 4 épitres, les quatre premiers chants du Lutrin et le traité du sublime. L'édition contient également un nouvel avis au lecteur et une nouvelle préface. Belle impression, en italiques. Il existerait une édition de pièces de Boileau datant de 1670 dont parle Boileau sans mentionner la date, mais qui paraît introuvable ; Brunet la cite en commentaire, sans donner de date. Reliure en pleine basane marbrée d'époque. Dos à nerfs janséniste. Pièce de titre noire. Ensemble frotté. 2 coins émoussés. Il manque le second feuillet achevant le privilège (dernières lignes indiquant la date). Les deux frontispices sont également manquant, l'un devant figurer devant le titre, l'autre avant le Lutrin. Page de titre avec salissures. Importante édition. Reiss-Beschreibung in unterschiedliche Theile der Welt, nemlich in Türcken, Egypten, Palestina, Persien, Ost-Indien und andere weit entlegene Landschaften. London, printed for T. Bassett at the George in Fleet-street, 1674. 8vo., (8) + 72 + 75 - 87 + (1) + 88 - 89 + 89 - 188 + (4)pp., including final blank, text continuous despite pagination (see ESTC), blank strip cut away from foot of title-page but not near printed surface or ruled border, rather later calf-backed boards, sympathetically rebacked, spine fully gilt in compartments, with the early 20th century bookplate of Leonard Lionel Bloomsfield*>. Only edition. Wing P.1912. This is an off-piste little book by the natural philosopher and politician Sir John Pettus (ca. 1613-1685), best known now probably for his works on minerals and mining. In his dedicatory piece to his neighbour, Leister Devereux, Viscount Hereford, Pettus observes, self-deprecatingly, that 'possibly, these excursions might have been more excusable to me in my youth, than in my age; but it is a solace to me, that I can be yet youthful in my notions .....'. * Leonard Lionel Bloomsfield was an extraordinary bibliophile. His principal library of some 13,255 volumes (including incunabula and manuscripts and a large part of the personal library of the poets Robert Browning and Elizabeth Barrett Browning), is now held by Brighton & Hove City Library. Gesamtansicht von Speyer und Worms ('Spir Palatinat - Worms Palatinat'). 1674. Good. (MACHIAVELLI, Niccolo. Dacres, Edward, trans.) 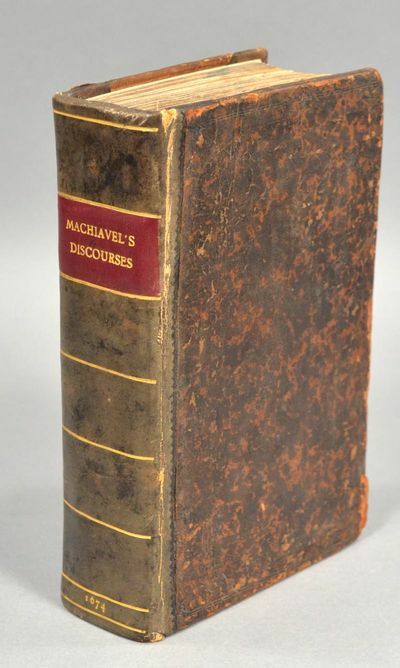 MACHIAVEL'S DISCOURSES UPON THE FIRST DECADE OF T. LIVIUS, Translated out of the Italian. To which is added his PRINCE: With some animadversions noting and taxing his errors. By E.D. The Second Edition much corrected and amended. London: Printed for Charles Harper at the Flower-de-luce over against St. Dunstans Church, and John Amery at the Peacock over against Fetter-lane, both in Fleet-street, M. DC. LXXIV . The two works in this volume, translated by Dacres, were first published separately in 1636 and 1640 respectively. The first combined edition was printed in 1663; and this is the second edition thus, of the combined edition, corrected and amended. Two slightly different title pages are noted for this edition: in addition to the publisher information, the first supplies bookseller information (to be sold by Thomas Burrell and William Hensman) and the publication date is given in arabic numerals; while the second, offered here, omits the bookseller information and has the publication date in roman numerals. Frontispiece portrait of Machiavelli, engraved by R. White. [xxiv],686, pp., including the portrait. 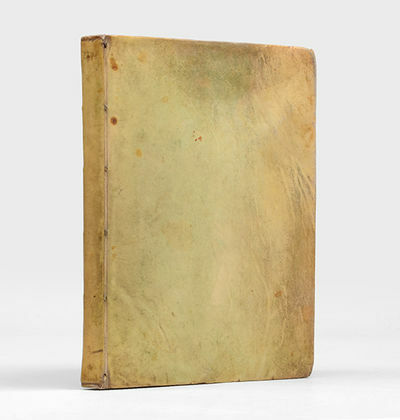 Octavo, 17 x 11 cm, contemporary leather boards, worn and rebacked, with endpapers renewed. All edges marbled. The Prince has a separate title page dated 1673. Many errors in numeration. Complete, clean, and very good overall. Although Machiavelli's writings in the original Italian, as well as his reputation, preceded Dacres' translation of the Discourses and the Prince to England, Dacre's translations gave wider exposure to Machiavelli's practical politics advocating councils based on political pragmatism and historical experience, and extended his influence on English political thought. Machiavelli's Discourses were of special interest at the time of publication in England because they provided a justification of republicanism. (Wing M135A). London: Henry Herringman (pr. by J.M.) Folio (30 cm, 11.8"). Frontis., , 41, [1 (blank)], 80, , 70 (59/60 skipped in pagination, text uninterrupted), 154, 23, [1 (blank)], 148 pp.. 1674 Cowley's collected poems in their fourth edition, beginning with a good impression of => the frontispiece portrait engraved by Faithorne, "an account of the life and writings" of the poet signed by T. Spratt, and two odes on Cowley's death by Thomas Higgons and Sir John Denham. Once considered the epitome of his era's wit, the author of "The Mistress" (verses in honor of love and various women, included in this volume) suffered a notable decline in popularity in subsequent years, prompting Pope's musing "Who now reads Cowley? . . . but still I love the language of his heart." And indeed despite the vagaries of reputation he has always had his worthy appreciators. Cowley's Pindaric odes are present here, as are the "Davideis" and "Davideidos"; also set forth are the "delightful little prose Essays (with verse interwoven)" for which The Concise Cambridge History of English Literature believes Cowley will most ultimately be remembered. Some sections have separate title-pages, bearing the same publisher and date information as the main Provenance: Front pastedown with small armorial bookplate and with bookseller's ticket from Cambridge, England. 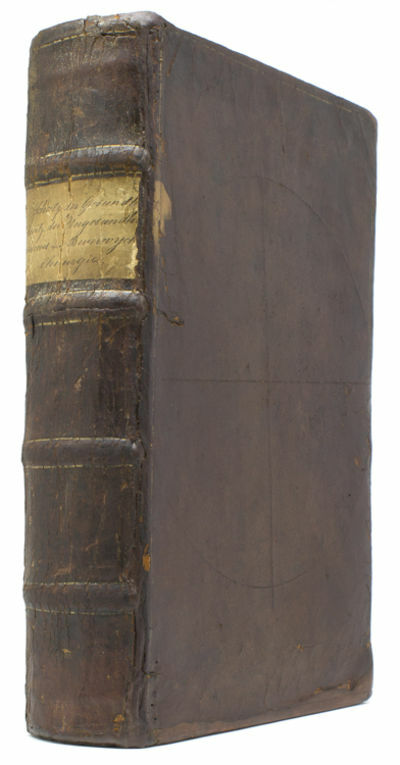 17th-century mottled calf, rebacked at some point in the 19th century and again more recently with hinges carefully reinforced (inside); spine gilt extra with gilt-stamped leather title label, covers showing the predictable acid-etching. Varying degrees of browning to pages; scattered incidents of worming in lower inner and outer margins, almost never affecting text. 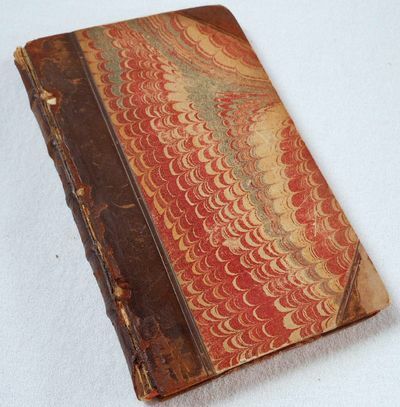 A handsome book in a binding both sturdy and attractive. à Paris: Chez gervais Clousier, 1674. Fine. Chez gervais Clousier, à Paris 1674, Un Vol. in 4 (16x22cm), (8) 208pp., relié. - First Edition. Rare. A title-frontispiece. The eight plates are absent. The original English édittion date of the previous year, 1673 The first French edition was increased by a few chapters by the author. Sheepskin half early nineteenth. spine Jansenist epidermis. Scuff on the part of title that makes it unreadable. Cap trimmed. Dr. Brown (1644-1708) effected this trip to Western Europe, Germany and the Balkans in 1668, and published his relationship with his return to England. This route will become a century later the travel excellence that English will. The regions described Brown were still little known in England, such as Thessaly, Bulgaria, Dalmatia ... As one of the first English travelers in these countries, including Greece, Brown could not s' help gather impressions on Antiques and mythology, but its mainly about key mining and water, geology and extraction of minerals, many observations can be found on the culture, customs, culture and tobacco in Greece its use by the Turks, Christians living in cave ... All things that struck the mind of the young traveler. --- Please note that the translation in english is done automatically, we apologize if the formulas are inaccurate. Contact us for any information! - [FRENCH VERSION FOLLOWS] Edition originale. Rare. Un titre-frontispice. Les huit planches sont absentes. L'édittion originale anglaise date de l'année précédente, 1673. La première édition française a été augmentée de quelques chapitres par l'auteur. Reliure en demi basane début XIXe. Dos Janséniste épidermé. Epidermure sur la pièce de titre qui la rend illisible. Coiffe rognées. 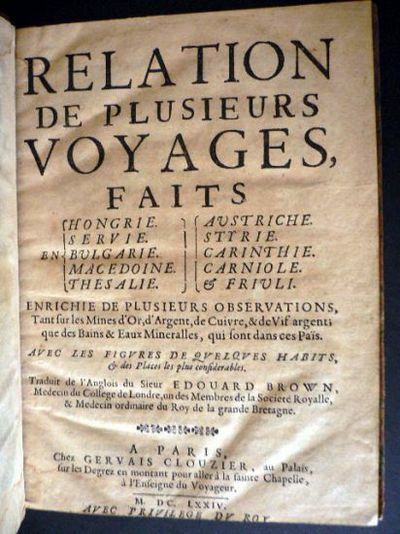 Le docteur Brown (1644-1708) effectua ce voyage en Europe de l'ouest, en Allemagne et dans les Balkans en 1668, et publia sa relation à son retour en Angleterre. Ce parcours deviendra un siècle plus tard le voyage par excellence que feront les anglais. Les régions que décrit Brown étaient encore peu connues en Angleterre, telles que la Thessalie, la Bulgarie, la Dalmatie... En tant que 'un des premiers voyageurs anglais dans ces contrées, et notamment en Grèce, Brown n'a pu s'empêcher de recueillir des impressions sur les Antiquités et la mythologie, mais son propos touche essentiellement les mines et les eaux, la géologie et l'extraction du minerais, on trouvera maintes observations sur la culture, les moeurs, la culture du tabac en Grèce et son emploi par les turcs, les chrétiens vivant dans des troglodytes... Toutes choses ayant frappé l'esprit du jeune voyageur. VIDA QUE EL SIERVO DE DIOS GREGORIO LOPEZ HIZO EN ALGUNOS LUGARES DE LA NUEVA ESPAÑA; principalmente en el Pueblo de Santa Fè. L'ANFITEATRO DEL VALORE, OVERO IL CAMPIDOGLIO DEL MERITO SPALANCATO ALLE GLORIE DELLA NOBILÀ TORINESE. 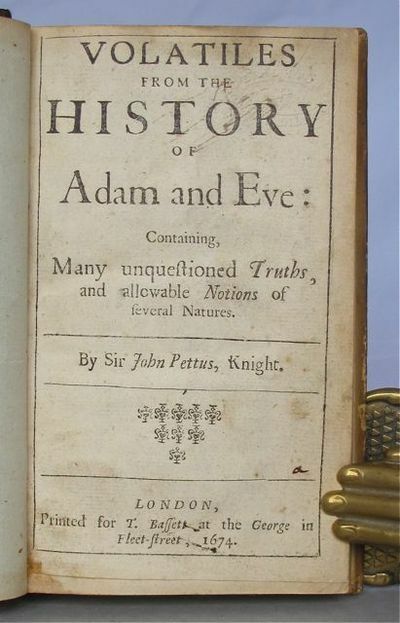 First edition of one of Hale's few published scientific works, disputing the theories of Descartes and Robert Boyle, relying in significant part upon Aristotle, and evidencing his "chosen public statement of the correct approach to the natural world". Contemporary calf, quite worn, Gloddaeth Library bookplate, effaced signature of ?Thomas Mostyn on title, ?later label; the Taussig copy. Printed by W. Godbid, for William Shrowsbury [etc. ], London, 1674. PUBLICAS ROGATIVAS; QUE DE ORDEN DE LA REYNA NUESTRA SEÑORA. Nürnberg, Hoffmann, 1674. - Des weiland Hoch-Edelgebohrenen Herrn George Christoff von Neitzschitz. Zum andern mal also heraus gegeben, dass Die im vorigen Druck nur angeregte Historien ergäntzet, Denen Raritäten . andere beygefügt, Die jetziger Zeit nach geänderte Orthe nachgetragen, Viel Orthe und Dinge in Kupffern und Rissen vorgestellet werden. Mit gestochenem Frontispiz, 17 (1 gefaltete, die 8 halbseitigen Kupfertafeln vorliegend noch unzerschnitten auf 4 Blatt) Kupfertafeln, 2 doppelblattgrosse Karten, 3 Blatt, 320 Seiten, 12 Blatt, Halbpergamentband der Zeit, 21,5 x 17,5 cm, Gutes Exemplar. Zweite, erweiterte und um Kupferstiche und Karten vermehrte Ausgabe dieser seltenen, auf Neitzschitz' Tagebuch beruhenden "Welt-Beschauung", die eigentlich eine Beschreibung seiner beiden Reisen in die Levante in den Jahren 1630-37 enthält. Seine hier beschriebene Reise nach Konstantinopel unternahm er im Gefolge der kaiserlichen Gesandtschaft unter Führung des Grafen Buchheim. Von besonderem Wert ist die Beschreibung des Berges Sinai, Carsten Niebuhr vermutet, "daß von Neitzschitz die Zeichnungen des Berges Sinai von den griechischen Mönchen erhalten habe" (Beckmann 235). London: for Giles Widdowes,, 1674. or an Account of the Chief National Improvements; in Some Political Observations, Demonstrating an Infallible Advance of this Nation to Infinite Wealth and Greatness, Trade and Populacy, with Imployment, and Preferment for all Persons. Small octavo (157 × 103 mm). 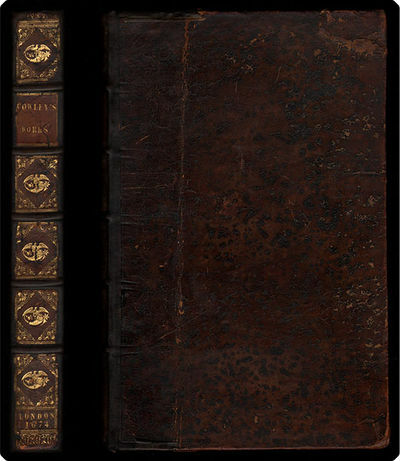 Near contemporary calf, gilt roll border to covers, neatly rebacked preserving the original spine, marbled endpapers. Gift inscription "W. Reynell to C.A. Reynell 23 Sepr 1890" to preliminary blank. Engraved armorial bookplate of Martin Bedwell of Westmninster. Lacking the initial licence leaf with printer's woodcut dragon device, title cut round and laid down. Some light spotting throughout. A good copy. First Edition of this "concise and well-argued survey of the British economy from the protectionist and mercantile point of view, which stressed both London and population growth as dynamics for change and prosperity and which gained notice in the Royal Society's Philosophical Transactions for 27 April 1674" (ODNB). Paris : Le Petit, Couterot, & Angot , 1674 Rare first edition of this account of the state of Christianity in Thailand, Cambodia and Vietnam by rivals of the Jesuits, the newly founded Société des Missions Etrangères. Incisione originale su matrice di rame, eseguita all'acquaforte da anonimo artefice dei Paesi Bassi su disegno tracciato nel 1674 da Giovanni Tommaso Borgonio (Perinaldo 1618 circa - ante 1692). Entro la parte figurata, all'angolo superiore destro, titolo inscritto in cartiglio, sormontato da arma sabauda sostenuta da putti; all'angolo inferiore, sempre a destra, tabella con 64 richiami in lingua latina, recante in alto lo stemma civico di Torino. La tavola è tratta dalla prima edizione di una monumentale descrizione dei dominii dei duchi sabaudi, siti al di qua e al di là delle Alpi: nell'opera editoriale si affiancano relazioni scritte a splendide vedute topografiche, disegnate da artefici attivi presso la corte torinese e tradotte su rame da incisori nordeuropei. Pianta topografica di Torino, capitale della dinastia sabauda. La città appare racchiusa da una robusta cinta bastionata, ed è difesa dalla Cittadella voluta da Emanuele Filiberto nel secondo Cinquecento; nella struttura regolare del tessuto urbano, risaltano le piazze su cui si affacciano gli edifici simbolici del potere ducale. Borgonio, autore del disegno per varie tavole del Theatrum, fu anche noto miniatore e blasonatore della corte sabauda. Esemplare in buono stato conservativo. AMERIQUE SEPTENTRIONALE DIVISEE EN SES PRINCIPALES PARTIES OU SONT DISTINGUES LES UNS DES AUTRES, LES ESTATS SUIVANT QUILS APPARTIENNENT PRESENTEMENT AUX FRANCOIS CASTILLANS ANGLOIS SVEDOIS DANOIS HOLLANDOIS. TIRES DES RELATIONS DES TOUTES CES NATIONS PAR LE S. SANSON GEOGRAPHE ORDINAIRE DU ROY. PRESENTEE A MONSEIGNEUR LE DAUPHIN PER SON TRES HUMBLE, TRES OBEISSANT ET TRES FIDELE SERVITEUR HUBERT IAILLOT. Incisione originale eseguita all'acquaforte su matrice di rame, senza testo al verso, dalla bella e fresca acquerellatura in più colori lungo i confini e alla scala lungo i bordi. Altro titolo con lievi differenze rispetto al principale all'extramargine superiore; entro la cornice graduata che riquadra l'immagine, all'angolo superiore sinistro, elegante cartiglio con titolo, indicazione dell'autore e dello stampatore; in basso a sinistra, edicola con scale e dati. Jaillot pubblicò originariamente una mappa del Nord America in due fogli nel 1674 Questa tavola è basata sulle mappe precedenti di Nicola Sanson, che mostravano la California come un'isola. Nel 1695, Jaillot pubblicò una nuova versione, a foglio singolo, per il suo L'Atlas Francois. Tutti e cinque Grandi Laghi sono ora mostrati. La maggior parte degli odierni Stati Uniti d'America si divide tra "Floride" e "Nouveau Mexique". La grande carta geografica, di notevole fascino decorativo, è ancora più interessante per la vastità dei territori ancora sconosciuti, verso ovest. Esemplare in buono stato conservativo, tracce di piegature per l'inserimento in un probabile atlante composito; al verso bindella di rinforzo alla parte della piega centrale. St. Paul's cathedral in London had been almost completely destroyed in the 1666 Great Fire. What was left standing had to be demolished. The 1674 Royal Commission, issued on 12th November 1674, not only authorised the final demolition but charges the Lord Mayor, Sir Robert Hanson, and a large group of named commissioners "to demolish and take down what is yet remaining of the old fabrick, and to begin, and carry on the new work ...... and to call to your aid and assistance, such skilful artists, officers, and workmen, as ye shall think fit .....". "And although we are very sensible, that the erecting such a new fabrick or structure according to the design above mentioned, will be a work not onely of great time but also of very extraordinary cost, and expence, (far above that of the repairs either former or later:) yet are we in no sort discouraged from undertaking the same .....".And the King promises to contribute £1000 p.a. towards the rebuilding costs, but hopes also that local residents in the City "will be ready to follow Our example by chearful and bountiful supplies to the carrying on and finishing the said work ......". Donations would be received by the Dean. Indeed, the Commission set out not only the scheme for national and local fund-raising, but also set the parameters for financial and project management and accountability. Among those commissioned was "Christopher Wren Doctor of Laws, Surveyor General of Our Works".In 1675, the year following, work on the new cathedral, based on Wren's so-called 'Warrant Design', would begin. It was not declared complete, however, until 1711.folio, title printed within double-ruled borders, woodcut of royal arms, 39 + (1)pp., bound recently in a fine old-style quarter calf gilt over marbled boards by Trevor Lloyd. A fine copy., 1674. First edition: very scarce. Wing C.2939. ESTC & OCLC together locate copies at 5 libraries in B.Isles + 4 elsewhere: N.L. Israel + Bayerische Stattsbibl. + Huntington + Texas.. St. Paul's cathedral in London had been almost completely destroyed in the 1666 Great Fire. What was left standing had to be demolished. The 1674 Royal Commission, issued on 12th November 1674, not only authorised the final demolition but charges the Lord Mayor, Sir Robert Hanson, and a large group of named commissioners "to demolish and take down what is yet remaining of the old fabrick, and to begin, and carry on the new work ...... and to call to your aid and assistance, such skilful artists, officers, and workmen, as ye shall think fit .....". "And although we are very sensible, that the erecting such a new fabrick or structure according to the design above mentioned, will be a work not onely of great time but also of very extraordinary cost, and expence, (far above that of the repairs either former or later:) yet are we in no sort discouraged from undertaking the same .....".And the King promises to contribute £1000 p.a. towards the rebuilding costs, but hopes also that local residents in the City "will be ready to follow Our example by chearful and bountiful supplies to the carrying on and finishing the said work ......". Donations would be received by the Dean. Indeed, the Commission set out not only the scheme for national and local fund-raising, but also set the parameters for financial and project management and accountability. Among those commissioned was "Christopher Wren Doctor of Laws, Surveyor General of Our Works".In 1675, the year following, work on the new cathedral, based on Wren's so-called 'Warrant Design', would begin. It was not declared complete, however, until 1711. folio, title printed within double-ruled borders, woodcut of royal arms, 39 + (1)pp., bound recently in a fine old-style quarter calf gilt over marbled boards by Trevor Lloyd. A fine copy. Stockholm, Sweden: Niclas Wankijff, 1674. Engraved title page by Isebrandus Compostell. [xciv], 1080 pages (old testament), followed by 300 pages (new testament), [iv], 64 pages. Early (circa 1800) full maroon leather binding with a hand-tooled brass clasp, fully functional, finished with steel fasteners (nails). Minor shelfwear and rubbing, including a small indentation and scuff to the rear board. Gilt title "BIBLIA" and line-ruling in blind on the otherwise undecorated spine, which has five raised bands in the 17th Century style. Protected in a custom made fleece-lined diagonal cut half slipcase, with a short base on the face of which a leather label that reads "1674" is affixed. All page edges gilt. Minimal loosening of some page gatherings (signatures). First three leaves have small tears, a few tiny chips, and rubbing to the extremities. Several pages and slightly browned and/or slightly soiled. A very handsome volume. Association : Previous owner's names/inscriptions on the front endpapers include: Rev. John Wigren No. 228; Denna booken Elmer hafven, ester min dod John Wigren; Giften til A. P. Wigren af E[ric] Shogren Den Jan 1873. John Wigren (1820-1907) a Swedish Methodist minister, came to the United States in 1852 and served churces in Andover, Swedona, Bishop Hill, Galva, Moline and Chicago. Erik Shogren (1824-1906). An adherent of the group of believers in Helsingland called Readers, or Devotionalists, he felt strongly drawn to Methodism. He travelled to California and elsewhere, eventually living in Chicago 1855-59 and 1864-65, Bishop Hill 1870-76, Galesburg 1883-84, and Rockford 1884-85. He served as presiding elder of the Chicago district in 1885 and 1886, and afterwards as pastor in South Chicago, retiring in 1889. Keywords: Janssonites, Religious Separatist Colonies.. First Edition. Hardcover. Very good condition. 12mo - over 6¾" - 7¾" tall. Introductionis in universam geographiam tam veterem quam novam. Libri VI. Accessit P. Bertii breviarium Orbis Terrarum. Venetiis (Venise), Balleonium, 1674,. pt. in-8vo, 465 p., dont le titre grave + 5 ff. + 1 planche depliante, tampons de la 'Pontificia Biblioteca Leontina Antikariense' sur garde, ex-libris ms. sur titre ,Ioannis Bapte. Mondeleij', reliure en parchemin d'epoque, dos avec titre manuscrit. Exemplaire en bon etat.. Philip Cluwer (Clüver, Cluvier ou Cluverius), ne en 1580 a Gda sk en Pologne, etait un geographe et historien allemand. Il possedait presque toutes les langues de l'Europe. Il voyagea en Angleterre, en France, en Allemagne, en Italie. Il enseigna avec distinction a Leyde, et y mourut en 1623. L'edition reprend le format de l'originale publiee en 1629 (Leiden, Elzevier).Please notify before visiting to see a book. Prices are excl. VAT/TVA (only Switzerland) & postage. Brunet 19607. "Glossographia; or A dictionary interpreting the hard words of whatsoever language, now used in our refined English tongue; with etymologies, definitions, and historical observations on the same Also the terms of divinity, law, musick, physick, mathematicks, war, heraldry, and other arts and sciences explicated"
[London]: "printed by Thomas Newcomb, and...to be sold by Robert Boulter". 1674. "Fourth edition ""with many additions,"" 8vo, pp. 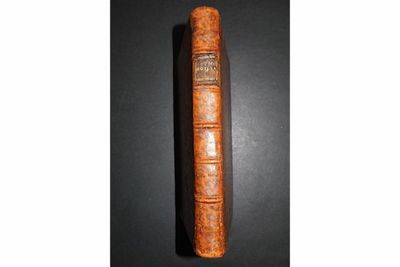 , 706, ; text in double column; full 20th-century paneled calf, gilt spine, burgundy gilt morocco spine label; title page mounted and laid down, bottom edge of A2 repaired; a very good, sound copy over all. 19th-century ownership signature ""J.A. Dollond"" (?) at head of title page (slightly affected by trimming). First published in 1656, this work, which brought Blount nothing but his own satisfaction, was revised and enlarged by William Nelson in 1717 and adopted by Edward Philips in his New World of English Words published a year later. Starnes & Noyes, p. 46: ""Blount is the first lexicographer of a purely English dictionary to attempt an etymology of words."" He is also the first English lexicographer to cite authorities consulted. Wing B-3337; Alston V, 51; Vancil, p. 26." Geneva, Johann Herman Widerhold, 1674.. Folio. 4 vols. bound as 1. , 218, , [2 blank]; , 236, ; , 244, , [1 blank]; , 231,  pp. First title-page printed in red and black, each title-page with Widerholds's woodcut device (motto: "Gradatim ad sidera tollor"). With 31 engraved plates (1 folding), including frontispiece and portraits of the author and his wife, by Jean Jacques Thourneyser. Further with woodcut initials, head- and tailpieces, factotums and several small woodcuts in the text. Contemporary vellum, manuscript spine-title, blue sprinkled edges.. First edition in German of Pietro della Valle's deservedly famous narrative of his travels in the Middle East, with an excellent account of Muscat and the Arabian Gulf and references to Dibba. Della Valle, an Italian nobleman, sailed from Venice in 1614 to Istanbul, where he arrived in August 1614, spending a year to explore the city. He continued to Rhodes, Alexandria, Rosetta, Cairo, crossing the Sinai desert to Jerusalem, Damascus and Aleppo. From there Della Valle proceeded to Isfahan (Iran) to meet the Safavid ruler Shah Abbas I. He sojourned in Persia until early 1623, witnessing and commenting on the escalating conflict between Shah Abbas and the Portuguese empire. In 1621 he decided to return to Europe and set off for the Persian Gulf, but the Persian and English blockade prevented his sailing. By way of India he finally sailed for Muscat in January 1623, from he crossed the Arabian Gulf to Basra, continuing overland to Aleppo, arriving in Europe in 1626. During his travels he wrote regularly to his learned friend in Naples, Mario Schipano. These 54 letters formed the basis of an account of his travels that was first published in Rome as Viaggi di Pietro della Valle from 1650 to 1658. "Della Valle displayed excellent narrative and descriptive skills, powers of acute observation, and a genuinely scholarly breadth of learning. He refused to comment on what he had not witnessed himself or checked against the best authorities [...] Della Valle's eighteen letters from Persia provide one of the most detailed sources of information for most aspects of Persian life in the second half of Shah Abbas' reign" (Gurney). - Engraved armorial bookplate on paste-down. Evenly browned throughout, some spotting, few quires in volume 3 with wormholes in gutter margin, not affecting the text, otherwise in very good condition. - VD 17, 39:135561Q. Tobler, p. 95. Cf. Atabey 1269-1271 (other eds. ); Blackmer 1712 (French ed. ); Gurney, "Della Valle, Pietro", in: Encyclopaedia Iranica (online ed.). "Ordinanza della Cavalcata che si fece nell'ingresso in Vienna dell'Augustis.ma Imp.a Margherita fuori della Porta d'Ungheria V. Decembre MDCLXVI". Aus Galeazzo Gualdo Priorato, "Historia di Leopoldo Cesare [...] Parte terza". [Wien, Hacque, 1674].. Bildausschnitt ca. 33,5 x 71 cm.. Nicht bei Nebehay-W. Vgl. Hamann S. 279.- Seltene und prachtvolle Darstellung des Hochzeits-Festzuges, zeigt das Lager der jungen Kaiserin knapp außerhalb der Stadttore Wiens. Oberhalb eine Ansicht Wiens mit den Vorstädten (Kopie des 'Prospectus orientalis' nach G.M. Vischer - danke Clemens Paulusch), links und rechts Legenden (1-53). Die eigentliche Darstellung ist nahezu ident mit jener aus dem 10. Band des "Theatrum Europaeum", vermutlich angefertigt von Melchior Küsel.- Kaiserin Margarita (geb. 1651 in Madrid - gest. 1673 in Wien) war die erste Gemahlin von Kaiser Leopold I. "Nach dem Scheitern seiner Ehepläne mit der spanischen Infantin Maria Theresia ... willigte Kaiser Leopold in eine Verbindung mit deren jüngerer Schwester Margarita ein, um die gewünschte Verbindung zu Spanien weiter zu verstärken und die Erbansprüche auf Spanien aufrechtzuerhalten. Margarita, die aus einer Verwandtenehe von Onkel und Nichte stammte, war ihrerseits die Cousine und Nichte Leopolds, den sie auch während der Ehe 'Onkel' nannte. 1663 wurde die lange geplante Verlobung der Zwölfjährigen verkündet. Die Hochzeit fand zu Ostern 1666 per procuram in Spanien statt. Die Vierzehnjährige reiste mit großem Gefolge von Madrid nach Barcelona, von dort aus in einem prächtigen, goldverzierten Schiff und Begleitgeschwader von 34 Galeeren nach Genua ... zu Land weiter über Mailand und Brescia, wo sie im Oktober 1666 an den kaiserlichen Abgesandten übergeben wurde. Das Kaiserpaar sah sich zum erstenmal in Schottwien. Anfang Dezember zog die Braut endlich in Wien ein. Höhepunkt der wochenlangen Hochzeitsfeiern war ein prunkvolles Roßballett auf dem Burgplatz" (Hamann).- Bis an den Rand beschnitten, Faltspuren u. Randeinrisse alt hinterlegt, verso tlw. angestaubt, tls. etw. fleckig.